THE sub-mountainous zone comprising Gurdaspur, Hoshiarpur, Ropar, Chandigarh, Dera Bassi, Ambala, Pinjore, etc is blessed as far as its suitability for growing fruit plants is concerned. Its climate gives you an opportunity to select any of the nearly 25 species of fruits that can easily be grown in gardens. One of the sturdiest among these fruits is the chikoo that is popular with both the home gardeners as well as orchardists. A rich source of digestible sugar, the chikoo is rich in protein, fibre and minerals like phosphorus, calcium and iron. Some like this fruit as it is fleshy while others savour it for its sweetness. 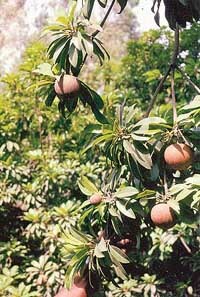 The chikoo tree begins bearing fruit within three years of planting. One of the main reasons for its popularity with the gardeners is that there is no danger of pilferage of the fruit as it is ripened in the basket and not on the tree, where it remains hard, astringent and rich in latex (the milk that oozes out when it is scratched). Not many people know that the latex extracted from the chikoo stem forms the base material for the chewing gum. to 15 days in this season is sufficient. This interval can be extended to 30 days in winter. The chikoo plant is also not fussy when it comes to soil type. It can be grown under rain-fed conditions too. This is the right time to plant chikoo saplings. The Cricket Ball, chattari or kalipatti varieties bear excellent fruit and also have a long life. The plants have uniform growth and are thus suitable for home gardens. Since it is an evergreen tree, it needs no pruning. However, the dead and diseased limbs should be removed periodically. Also, some of the branches have to be removed to let light filter in when the tree grows old. The chikoo tree gives two crops in a year and the flowering continues almost throughout the year. A fully-grown tree can be given five baskets full of well-rotten farmyard manure, one kilogram of CAN (Kisan Khad) and half a kg each of superphosphate and muriate of potash. Whole of the farmyard manure, superphosphate and muriate of potash can be added now and CAN can be split to be added half now and the other half a month later. The fertiliser should be uniformly spread in the basin of the plant, which should be as wide as the plant canopy. Urea can be used as a substitute for CAN but then the dose will have to be halved. What the gardeners really get confused about is the timing to pluck the fruit. There is no apparent indication about the right stage to pluck the fruit. You learn by experience and then you can judge the timing even by looking at the size of the fruit. The fruit is to be picked when it is fully matured and then it is artificially ripened. On the surface of the fruit you will find a brown scurf. When it gets removed with ease and the fruit has a yellowish tinge, it is time to pick the fruit. Also, a little scratching at the surface will reveal yellow flesh beneath. Do not pluck the fruit if you find green tissue or milky latex oozing out upon scratching it.